The cry of “lying press” acted like a siren in Germany. It shook things up, roused people and got people listening. But were the accusations true? This question was fiercely debated both in public and in private, and soon gave rise to others. What are the roles of journalists? Or better, which roles do they have left following the rise of tech-intermediaries like Facebook and digital technologies, in which the audience publish their own content? This irritating cry ended up triggering a long-overdue debate on the society we want to live in. Around four years ago, the Islamophobic Pegida movement and the Alternativ für Deutschland (AfD) party turned an ancient term into their battle cry: “lying press.” They claimed that the media only communicated a distorted view of their positions, manipulated, and were guided by politicians and by their own interests. Chants of “lying press,” “lying press” banners, and violence and threats of violence against journalists amazed and worried many media companies, and gave them pause for thought. The same issues concerned and worried society at large. Do the media deliberately hide negative facts about refugees and Muslims? Did they have reasons for painting President Putin as the bad guy in the Ukraine conflict? Are they the mouthpiece of some kind of elite and just taking the public for a ride? To find answers, communication studies researchers Irene Neverla and Volker Lilienthal presented 16 perspectives from academia and practice in a lecture series aimed at ordinary citizens at the University of Hamburg. They then brought these perspectives together in an easy-to-read volume: Lügenpresse. Anatomie eines politischen Kampfbegriffs [Lying press. Anatomy of a political battle cry]. The project is a success, as most of the papers not only explain the problem, but also communicate fundamental knowledge on how today’s media society works, what risks it holds and what needs to change. In addition, the book illustrates how useful it can be to link the findings of media researchers with the experiences of media professionals. This success also leads to the formulation of two remits: for researchers to constantly live up to their responsibility to society, and for media professionals to face the public, initiate or become involved in debate, endure headwinds and be assertive when it comes to dealing with views that are not merely opinions, but hatred and (presumed) criminal offences. Introducing the volume, Irene Neverla explains the conceptual history of why the public has always had a divided view of journalism. She writes that the term “lying press” as it is used today is an accusation of mendacity, a claim that deceitful elites are conspiring against “the people,” and an indication that ‘facts’ today are backed up by feelings rather than evidence. This is also a consequence of the way social media works, explains Katharina Kleinen-von Königslöw. Because self-affirmation and recommendation are the pinnacle of achievement on social media, views are reinforced and energetically championed, regardless of whether or not they are verifiable. Despite this, most people have more trust in the established media than they did before the “lying press” debates. Nayla Fawzi, Magdalena Obermaier and Carsten Reinemann refer to various studies that show this. However, they also show that those who have mistrusted the established media for a long time are now making their presence felt ever more aggressively, especially as they do not feel that established media take sufficient notice of them. Several authors describe the extent to which this anger now manifests itself in physical attacks against journalists in Germany (Martin Hoffmann, as well as Tobias Gostomzyk and Kai Gniffke). So what can be done? Michael Brüggemann advises more differentiated reporting, describing this convincingly using the example of the climate change debate and the term “denier.” He argues that it is important not to tar everyone with the same brush, i.e. poorly informed people who voice critical opinions and those for whom the term “denier” is truly appropriate, as they deliberately disseminate untruths. Some authors explain the disaffection between the public and journalism with unfortunate developments such as the proximity of journalism to elites (Uwe Krüger) and the appearance of proximity to government (Michael Haller, using the example of how the refugee crisis was reported). They then link this to suggestions for how to change things: Journalists should be more transparent about how they work (Haller) or appoint ombudsmen to do this for them (Horst Pöttker). Freitag editor Jakob Augstein states that there is a need to really listen to what ordinary people are worried about, so that they can systematically be given a voice. Spiegel editor Klaus Brinkbäumer provides principles for a kind of journalism that explains the full diversity of the real world and maintains an attitude of critical distance, including to itself. This, he argues, would help journalists to admit to their own mistakes and to endure and take seriously the positions of others. Giovanni di Lorenzo (Die Zeit) advises a greater focus on research, i.e. persevering with the power of facts and verifiable backgrounds. Society cannot reduce its reaction to political issues to feelings, he argues. The fact that knowledge is power has been clear since as far back as the Enlightenment. Heribert Prantl (Süddeutsche Zeitung) wants journalists to return to the role connected to the freedom of the press that is rooted in Article 5 of the German constitution. Becoming conscious of this once again is the beginning of “good” journalism, he argues. Each of the lectures in the winter 2016/17 semester was attended by several hundred people – a clear demonstration of the huge need for knowledge and debate. This should motivate more media houses and educational institutions to seize the opportunity to explain what responsible journalism is, what we can expect from it, and the extent to which it forms the backbone and guarantees the continuation of a democratic society. In other words, ignorance is the enemy of democracy. This review first appeared in rezensionen:kommunikation:medien (r:k:m). Dr. Marlis Prinzing is a Professor of Journalism Studies at Hochschule Macromedia in Cologne, focusing on ethics, the digital transformation and innovation. She is a columnist (“Der Tagesspiegel,” “Der Standard”), presenter, author and editor. Previous roles have included Project Leader at the European Journalism Observatory at the University of Lugano and a guest professorship in Riga (Latvia). Dr. Prinzing gained her doctorate with a company and industry analysis (ABB-Wissenschaftspreis 2000). Volker Lilienthal, Irene Neverla (eds.) 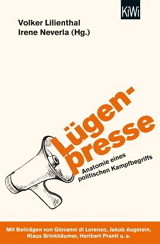 (2017): Lügenpresse. Anatomie eines politischen Kampfbegriffs. Cologne [KiWi-Taschenbuch], 320 pages, EUR 9.99.